Christmas Stockings are what we do Best! Celebrating Our 22nd Season Online! Thanks to our wonderful customers! Our Plaid top Christmas Stockings are made with a plaid cuff, high quality felt boot, lambs wool trim with an adorable embroidered appliqué. Choose either the Santa or Snowman Christmas Stocking. These are a nice big size stocking with adorable accents. Hanger hooks are green or red felt. Simply type in glitter color choice next to name to be personalized on order form or in the comment box on the order form. Lettering limited to 7 to 9 letters. We Personalize One Name Per Stocking. 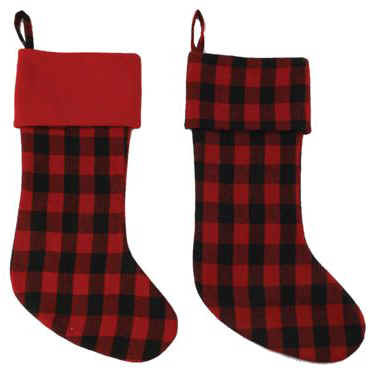 Diagonal Size 22" x 9"
Hot New Item...Our New Lumber Jack Plaid Christmas Stockings are made with a red or plaid cuff. High Quality heavy duty stocking is lined and has a fold over cuff with a plaid hanger hook. Lettering limited to 7 letters. One Name Per Stocking. Diagonal Size 21" x 8"
Look how cute our Plaid Moose Christmas Stockings are! They are made of quality felt, plush and Plaid fabric. They are accented with rug stitches, scarf, hat, bell or holly, buttons and much more. Nice Big Size and Absolutely Adorable! 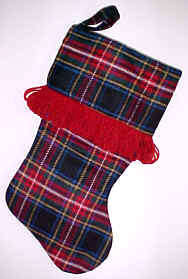 Beautiful Plaid Christmas Stockings are made of High Quality wool fabric with fold over plaid cuff. These Wool Plaid Christmas Stockings are accented with looped red yarn. Our Plaid Christmas stockings are lined and nice big size. Lettering limited to 8 letters. This is a cute 3-D Plaid Christmas Stocking with a large appliqué Snowman Christmas Stocking with Plaid accents. It is made of ribbed red fabric at the boot and green plaid cuff. This plaid Snowman Stocking is adorned with so many cute details such as buttons, "Let is Snow" Shovel, scarf, plaid hat and snowflakes. Made of quality fabric, also lined and have a ribbon hanger hook. Lettering limited to 7 letters. We Personalize One Name Per Stocking. This is our Jumbo Plaid Christmas Stocking that has plaid trim at the cuff. This Christmas stocking has a red boot and a green felt cuff and is a nice big size. It is made of quality felt fabric with Plaid ribbon trim. You won't go broke filling this one up, it's just the right size! Choose Gold or Silver Glitter - simply type in glitter color choice next to name to be personalized on order form or in the comment box on the order form. Most Plaid Christmas Stockings are Personalized Free! Copyright © 1998-2019 The Stocking Place ~ www.thestockingplace.com ~ All Rights Reserved.